What is an inflatable air lounger? It is just that, a better option of a lazy boy couch. You see, this lounger is made to serve very many purposes. For example, you can use it as a bed, a sofa, a chair or just an item to laze around on when you want to laze outdoors. Is it comfortable? Very. Is it cheap to buy? Very. Is it something you would want to bring with you on your camping trip? Of course, and much more than that. To tell you the truth, there is no better way to enjoy camping and outdoor leisure than with the comfort of an inflatable lounge chair. When out camping, you need a good chair that can give you the same comfort, if not better, as you get at home. Thankfully, the inflatable chairs give you that opportunity. Talk of something light, portable, comfortable, stylish and so appealing… this is what everyone needs to make their camping experience fun and unforgettable. As the youngsters play outside on the beach, you will be lounging in your inflatable chair with a nice book on one hand and a drink in the other. Since these chairs are inflatable, they are the best if you are working with a limited budget and space. There are few cheap pleasures in this life and the lounger is one of them. For example, the ability of the lounge chair to blow up within no time is a plus for any kind of outdoor adventure. When you sit or lie down on it, the chair envelopes every contour in your body making you so comfortable and relaxed, giving you a free massage, sort of. The lounge chair comes in all sorts of designs and price range. Did you know one thing about inflatable loungers? When you are done using them, you just have to deflate them, pack them away until the next time you have to use them. The air lounge is designed solely to make you relax and have the time of your life. You will be glad to know that the inflatable air lounge can be multifunctional and it can serve any comfort purpose as you deem fit. You can use it as a chair, a bed or a sofa. This means that you will not have to bring a camping cot along since you can lounge on the sofa and then sleep on it overnight. You cannot just arise and go buy inflatable lounge chairs blindly. You need a simple guide like this one to buy the right thing. There are so many varieties out there and therefore the more you know the better. How long will it take for the air to start to leak from the lounger? What should I do if my lounger gets wet? There are many types of inflatable loungers. Some are used on the pools and others make great camping sofa-beds. It is the latter that we are going to talk about. The most popular type of inflatable lounges is the camping bed/sofa and chair. In fact, these are so popular such that some of the inflatable lounge chairs come with their accompanying footrest. Some of them are fashioned for kids while some are made with features like armrests and cup holders. These are truly shaped like chairs. Then there are other types of inflatable loungers that are made to look like bean-bag-shaped lazy sofas. They sure do look a bit shapeless but wait until you get into it and that is when you will realize there is nothing shapeless about them. The design of these inflatable lounges is so ridiculously simple it is awesome. Some are made of parachute material and tell you what – you do not even need a pump to inflate them. All that you need to do is drag them through the air and they will fill up and then tie the top of the stuff sack and there … you already have an inflated lounger. The inflatable sofas/beds and lazy sofas are the most popular with many campers and you will see just why this is so when you buy yours. Going by the brand names, some of the most popular brand names for the inflatable loungers include KAISR, AeroNest, SubaYouth Beach Lounger, and Lamzac to name but just a few of them. 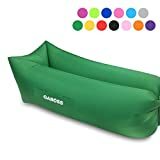 When buying your inflatable air lounge, you should seek to know how long it will last after you drag-fill it with air. Some can last up to four hours and after that, you will have to get off your lazy rear and drag-fill it with air again. Even before you buy your inflatable lounge, you have to understand how to set it up. Firstly, read some reviews about it and see whether it can be used on the kind of surface where you are going to use it. If you are going camping, mostly, this would be rough ground, sand for those camping on the beach, pavements or even grassy surfaces. You will find that you do not need to have a pump to inflate the inflatable lounges, that is, unless there is no breeze at all. All you need to do is give your lounge two scoops of air and it will be good to go. Then clip the opening, just tight enough and set it where you want it. It will keep inflated for more than 4 hours if it is of good quality. If you are using it on the beach, make sure you buy an inflatable lounge that has a securing loop so that you can secure it to the ground with a stick or an umbrella. Even when there is no breeze, you can try running along to see whether it will fill up. Just two scoops is what you need, then clip it and you can enjoy your lazy moments. Because it is already pre-shaped in the bean-bag shape. Setting it up should not take more than 5 minutes of your time and just like that, you have your inflated air bag. This is a multi-functional inflatable lounge chair. You can use it at your backyard or when you go camping at a park or beach. Gaboss inflatable lounger is available in a variety of colors ranging froa bright orange to black. 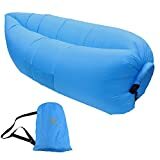 Quick inflation – has one opening that inflates faster than two holed inflatable sofa. It does not require an air pump. In windy weather, you can inflate it within 10 seconds by running few steps against the wind. It stays inflated for over 4 hours. Comfortable headrest design to use as an inflatable couch. Highly portable as it weighs just 1.8 lbs (0.8 kg) but can bear up to 440 lbs (200 kg). Can be used in swimming pools because it is waterproof and it floats. Made of parachute fabric material with a single layer without inner PE bag thereby preventing air leak. 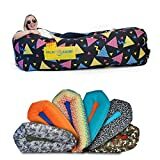 ChillaX Air Lounger serves as camping lazy bag beach sofa air bag outdoors or portable air sleeping sofa indoors. You can use it in the backyard, park or beach. It is one of the affordable inflatable lounge chairs. This lounger also comes in a wide variety of colors. Floats on water. It is a life ring, air sofa and inflatable “boat” and can last for 3 hours without permeation by water. This is a lightweight air lounger that is compressible enough to fit in your backpack. Has 3 side pockets for putting bottles, books, and smartphones. Safe because of tight sealing achieving great leak tightness. Inflates swiftly with fan air or breeze – It does not require a pump. You can even inflate it with air up to 80% by running for 8 seconds. The WooHoo™ Inflatable Lounger is one of the strongest inflatable air loungers out there. It supports a weight of 420 lbs (190 kg). It is also one of the largest. When inflated to the fullest, the lounger measures 79 x 36 inches (200 x 92 cm). Not bad, right? When used as a sofa, it will accommodate 3 people easily. The lounger is made of nylon which, as you may know, is a strong synthetic material. Made of high-quality rip-stop material. Its inner tube is waterproof and floats on water, therefore great for pool parties. Puncture resistant outer shell and free replacement inner tube in case of piercing saving the cost of buying another hangout. Lightweight and compact enough to carry anywhere for outdoor activities and hiking. It fits inside luggage and you can carry when going on vacation. This popular lightweight waterproof inflatable lounge can hold 440 lbs (200 kg) meaning 2-3 people can sit on it. It is made of PVC inner layer and Dual Ripstop material on the outside. You can buy this lounger in one of 5 vivid colors – black, blue, green, purple, and red. Square headrest offers superior support on the neck and upper back. Does not require a pump to inflate. Floats on the water. Adhesive strip secured interior lining guarantees longevity. Pockets and bottle holder to store important items. Comes with an instructional video on setting up and breaking down the inflatable air bag in seconds. Easy to inflate and it does not require a pump. It floats perfectly on the water making it great for pool floating. It is also a great inflatable raft for aquatic leisure. Elastic anchor loops for staking the lounger down during windy conditions. Have large side pockets that can hold snacks, ice cold beer, and reading glasses. 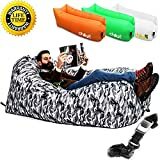 iZEEKER Inflatable Lounge is an air lounge chair, beanbag replacement, inflatable hammock and an air sofa available in 5 different colors – pink, black, blue, green, and purple. Easy inflation without a need for a pump. It is portable and multi-functional. You can use it as a lay bag, air sofa, air sleeping bag or inflatable hammock. You can take it for hiking, camping, to the beach and park. It is made of quality durable and waterproof lightweight materials that are skin friendly. It is weave sealed to prevent air leakage. How many people are on the lounger. The more people, obviously, the faster the air will leak out. How many folds have you made before you closed the bag after inflating it. The more folds, the longer the bag will keep the air inside. One way or another, the lounger will start to leak air from the very first moment you inflate it and, after 3 to 4 hours, you’ll have to get up and refill it with the air. If the lounger gets wet due to the moist ground due to being used in water, you’ll have to dry it out fully before packing it. Simply deflate it and let it dry outside. If you pack it wet, it might get severely damaged by mold and mildew and it’s serving time may decrease significantly. Note that not all inflatable loungers are meant to be used in water. Some are not waterproof and will deflate once put to water. After reviewing the features of top inflatable loungers, you are now wise on the best one for you. If you would like to sit two to three people, then you want an inflatable lounger that can support up to 500 lbs (227 kg). The best choice for this would be Wasing. Consider also the material and where you are going to use the lounger. For example, GABOSS is great since it is made of rip-resistant parachute material and will last longer when used it a bit harsher conditions than your backyard lawn. The Gaboss inflatable lounger is the best what happened to me this year. Man, it is such a cool thing. I use it on my porch and in my room too. Excellent for playing video games! Yes, this is a great invention, Rob. I don’t know when it was invented, but it has become so popular these days, it seem, every second person I know has one ? Man, on man, how happy I am after getting my lounger. I got a WASING lounger from Amazon and the same day I ordered 2 more for my garden. I am 63 years old and never had such a comfort in my backyard!